Here is where President Roosevelt will first set foot in central Washington in his inspection of the Grand coulee project. 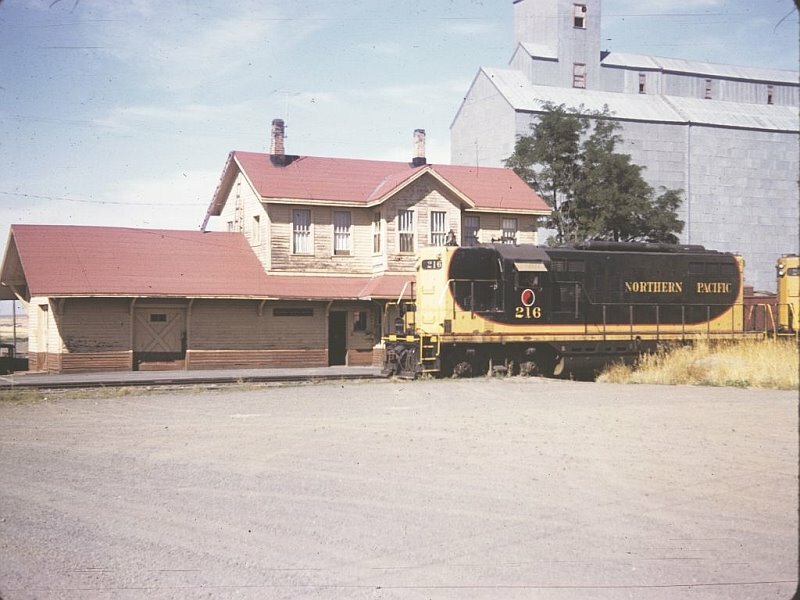 Soap Lake is 120 miles southwest of Spokane on the Great Northern, and the station is three miles east of town. Soap Lake is going to celebrate with true western hospitality. The road from the station to the town will be lined with flags. The town itself will be gaily decorated to welcome the chief executive. An exhibit of Columbia basin irrigated farm products will be arranged for the president’s inspection. The presidential train will go to Soap Lake via Spokane. It will come here early the morning of August 4 via the S.P.&S. from Portland and will be switched to the Great Northern tracks here. It is scheduled to arrive in Soap Lake about 3 am. The president plans to leave the train there at 9 am to go to the Grand coulee dam site, arriving there about 11 am. Returning, the presidential train will reach Spokane about 5:30 pm. 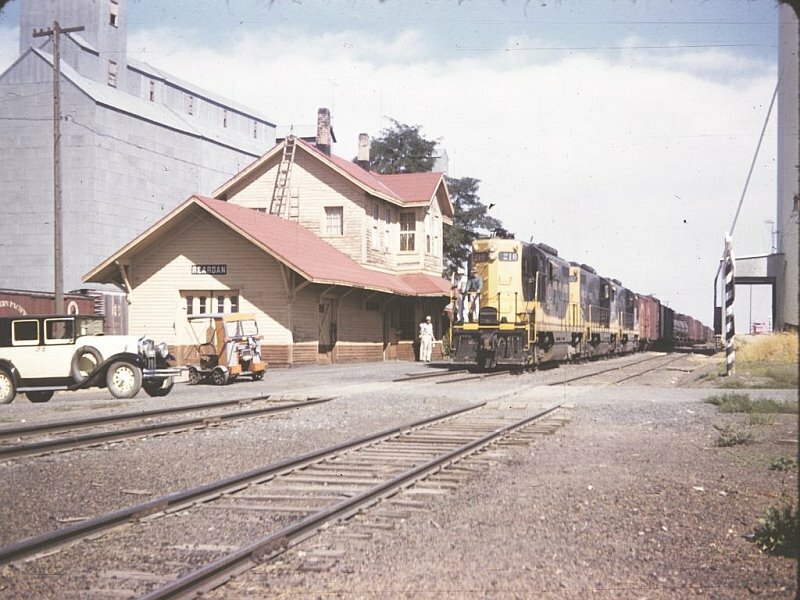 Notes from a Milwaukee Road inspection trip in August 1973. These were generated when executives of the Burlington Northern were inspecting the Milwaukee during a time when the Milwaukee wanted to be included in the BN merger, which had been closed 3 years earlier. 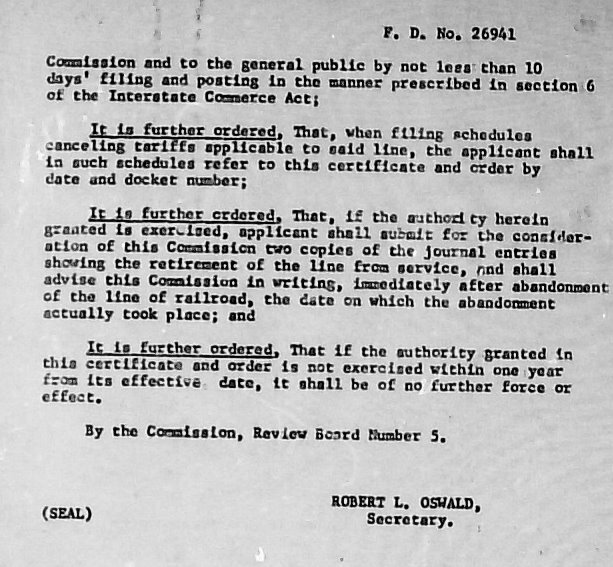 The Milwaukee petitioned the Interstate Commerce Commission to reopen the merger. The following is the areas of interest to this blog. The Moses Lake Port District is actively attempting to attract new industries to their facility, which is the former Larson Air Force Base at Moses Lake and is served exclusively by the Milwaukee Road. To date they have not attracted any major accounts; however, they are embarked upon a very extensive campaign and we are hopeful that this will result in a major development that will be mutually beneficial to Moses Lake and our railroad. This area has enjoyed a very substantial growth in food processing plants. Major developments of importance have been the location of the American Potato Company’s dried potato plant at McDonald and the continued expansion of Chef Reddy Foods at Othello. The Milwaukee Road Land Company has an industrial park area located at Royal City which is in the development stages. Several small industries have located in this park and our Industrial Development people and Sales Department are continually working with various parties to attract new industry to this industrial park. Below is part of a letter by C.F.B. Haskell to his wife. He was on reconnaissance for the Great Northern in its quest to find a suitable route through Washington. Haskell was an assistant engineer for the GN who did the physical search for the pass that was discovered by John F. Stevens. This pass is still in use today by the BNSF and US Highway 2. “…We left Waterville last Saturday morning and that night stayed at Coulee City in Grand Coulee. It is a little miserable town about six weeks old. The N.P. are building through the town and the Seattle Lake Shore & Eastern are, or have been doing some grading around there. Grand Coulee is a great hole in the country, by some supposed to be the bed of an ancient lake. On some maps it is called the old channel of the Columbia River. At all events it is very long, over 100 miles and from half a mile to 5 miles wide & about 1000 feet deep. Several hundred feet of vertical bluff of rock form the walls for 60 miles, where a man cannot climb up. There is only one place where this can be crossed for along way & that is at Coulee City, they think they have the world by the tail, and are bound to have a city second hardly to Chicago. “The hotel keeper is the greenest fellow out. We didn’t tell him who we were & he proceeded to give us a great yarn about the town & its future prospects. I was not feeling very good natured that night. Had ridden 30 miles with only one place where we could get water for either ourselves or horses and I told him what I thought of the country pretty freely. We got him started and argued with him & poked fun at him for an hour. He told us all sorts of absurd nonsense about the Great Northern road and we laughed at him and he evidently thought we were fools and got most wild. When we go back there we expect to see him again, & expect he will scalp us, as he will know who we are by that time. “The people generally size us up pretty quick when we get into town. I came in here tonight alone left my field glasses at the livery barn so no one would suspect that I was a R. R. man. These little towns are all wild over railroad matters & ask so many questions that it gets monotonous. I had never been here & thought if I kept still I should rest in peace. Alas! I had not been in the hotel ten minutes when a fellow walked in, “Hello, you here?” I looked up and saw a fellow from Waterville. I went into Supper and had just got seated when the fellow opposite looked up and asked, “Well you got down the river all right?” and on my failing to remember him he told me where he saw me. “It is annoying when I get settled down for a quiet rest or to write you or something or other to have a lot of folks coming around & ask a hundred insipid questions about the country the railroad & everything else. I think this country is a miserable country most of it. What I have seen of Eastern Wash I would rather have So. Dak. Until I saw this country I thought that the worst country in the world. This country is much of the way rocky & terribly dry. This is the wettest season they have had for years, & it is terrible dry and hot is seems to me. I never saw a country with so few springs & so little running water. Several times we got no water for a half a day & rode hard. There are clouds of dust every where. We can see a person traveling for miles by the cloud of dust in their wake. It seems to me it should be called the Great American Desert. I believe I never saw a country where the people living in it has so little liking for country, found so much to apologize for, and condemn. I found one very intelligent lady who said she thought a great wrong was done when this country was taken from the Indians, for it was never made for white people to live in. 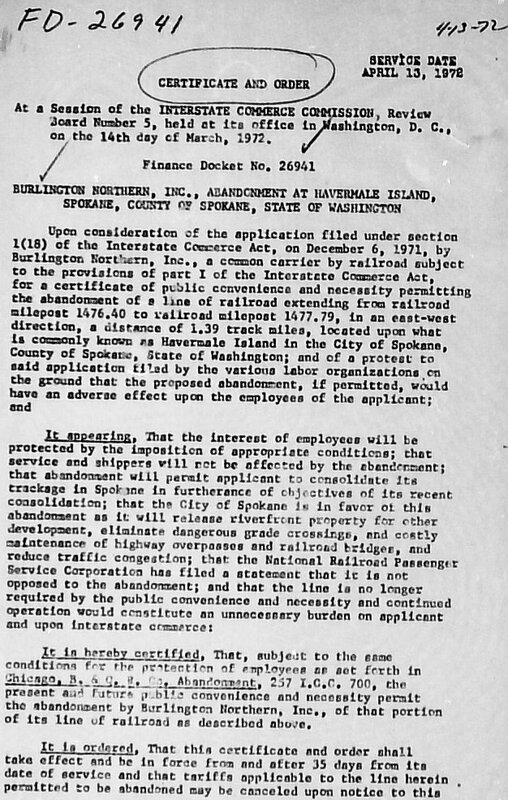 These images come courtesy of Aaron Schwarz, who kindly sent it to me after discovering them amongst the heaps of paper from the Interstate Commerce Commission. Of note is that this piece is a tad bit out of my service area, but as all roads in the Big Bend had their start in Spokane, it is too good to pass up. Fire carloads of sheet piling, en route to the dam site, went into the ditch yesterday at Hansen, near Almira on the Northern Pacific. A split rail was said to be the cause. A passenger train on the branch, going to Spokane, also was held up by the wreck. Valuation Section Washington 7-A covers what is known as the Moses Lake Line which leaves the Warden-Marcellus branch, …at Tiflis and extends in a general northwesterly direction about 16 miles to Neppel on the eastern shore of Moses Lake. The general exploration work for this branch was done in conjunction with that work on the Warden-Marcellus Line, although a close reconnaissance outlining the adopted route was made just previous to the instrumental survey. On June 25, 1911 a locating party started west from Tiflis and competed their work on July 31st , during which time they ran 42 miles of preliminary and 40 miles of location survey to obtain the 15 3/4 miles of adopted line, or about 2 2/3 miles each of preliminary and location for one mile of adopted survey. Just previous to construction, which took place in 1912 the line was resurveyed and some revisions made. Construction was carried on, under the supervision of an Assistant Engineer, who reported to the Assistant Chief Engineer in Seattle. The Line as constructed leaves Tiflis on a slight descending gradient for about a mile thence climbs to a summit in mile 4 on a varying gradient with a maximum of 1.5% thence descends to Sieler on a maximum gradient of .9%. From Sieler the gradients are generally descending with a maximum of 1.5% to mile 15, thence level to Neppel. In Mile 3 the line passes under the Connell Branch of the Northern Pacific Railway. The clearing, grubbing, grading and culvert work was let by contract to H.C. Henry, who sublet to three other contractors. Equipment and supplies were unloaded at Tiflis and hauled from there by team to points of use. A moderately heavy growth of sage brush and grease wood covered the uncultivated land which required clearing. Grading was started in May 1912 and completed in December of the same year. The work was largely done with teams and was light, averaging about 12,000 cubic yards per mile. A small percentage of classified material was encountered. The most difficult feature of the grading was the work in connection with the crossing under the Northern Pacific in mile 3 where is was necessary to maintain traffic while the material was being removed from under their track. Considerable grading has been done since the original work was finished in widening and removing the tops of cuts to improve the view at road crossings as required by the Public Service Commission. All the bridge work occurs in the first three miles west of Tiflis and was built by Railway Company Forces. Corrugated iron pipe for the culverts was shipped by rail to Tiflis, from where it was hauled to the sites by team. Track was laid by hand, 50# relay steel being used. Ballast was obtained from Neppel pit. The material for right of way fence, telegraph lines, station buildings, etc., was delivered by rail after track laying had been completed and construction work was carried out the Railway Company forces. 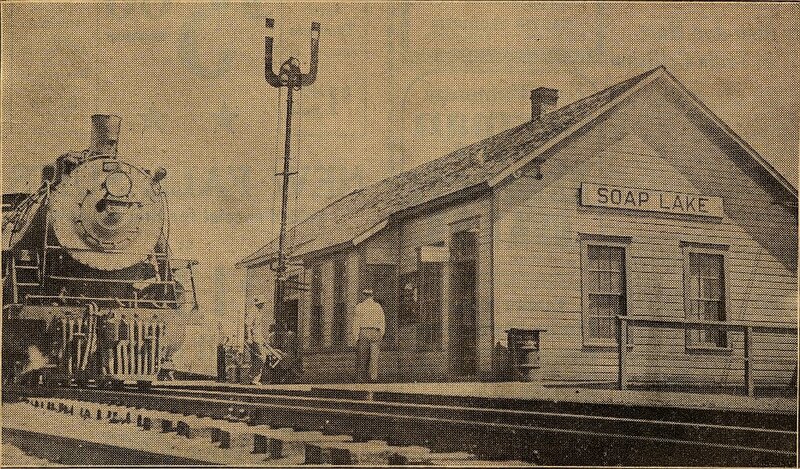 A 24 ft. by 88 ft. standard framed depot was built at Neppel. Telephones were installed in booths at blind sidings in addition to those in the depot. 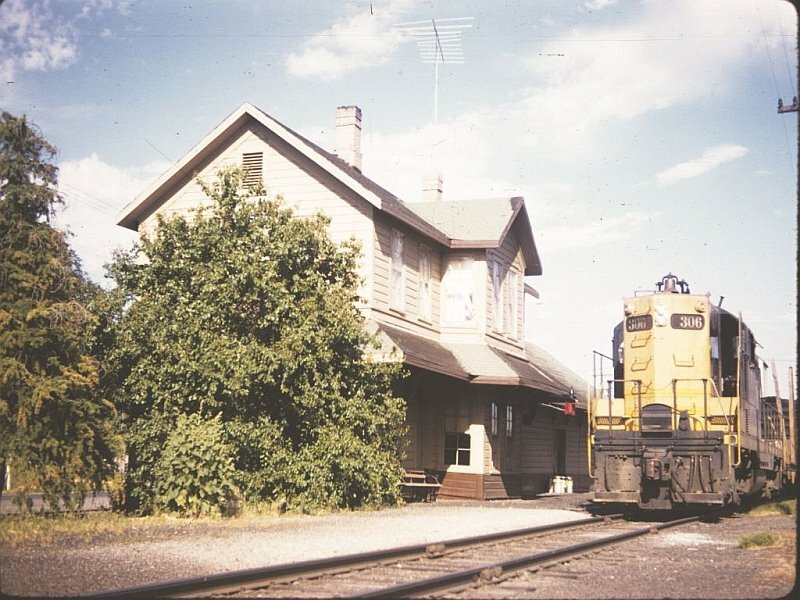 The line is operated as part of the Idaho Division, the usual branch line equipment being used. First photo is from Wilbur. The 2 story depots on the CW branch allowed the agent a place to live, in the upper floor. As the agents moved into their own houses, the NP did not need to maintain the upper floor, so a couple of the depots got the second story removed. Most, though, were torn down without having the upper story removed first.